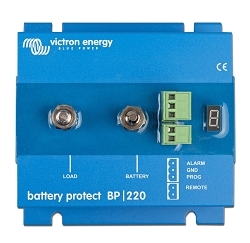 These Victron Energy Battery Protects are programmable relays that are used to shut off a battery when it gets low. They can be programmed to be voltage sensitive or they can be programmed to act on the command of an external device such as a Lithium Battery BMS. They all have a single digit LED display to facilitate programming. The Smart Bluetooth enabled models can display the programming menu on a tablet or smartphone and these allow a wider variety of programming options than the standard models. Most models are for 12/24 volts only but there is one 48 volt model in both Bluetooth and standard versions available. 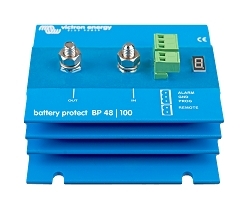 As well as being used as low voltage shutoffs for batteries then can also be used as charge shutoff devices in Lithium Battery Systems. In this case they are set up for external control only and it isnt possible to set them to operate in voltage sensing mode.